Jenni Mitchell grew up in Eltham and has been actively involved in the region for most of her life. She was elected by the community to serve as a Shire Councilor and has been a leader in local conservation and cultural issues within the region. She began painting at the age of ten with private lessons from Leslie Sinclair at Montsalvat, later graduating from Phillip Institute (RMIT) with majors in painting and printmaking under Betty Churcher, Peter Booth and Brian Seidel. Further studies include a diploma of Professional Writing and Editing from NMIT and a Master of Visual Arts from Monash University . Always a traveller and seeker of wild places to paint and photograph, she has visited extensively throughout the inland regions of Australia with frequent return field trips to the Flinders Ranges , Lake Eyre , Tibooburra and the Wimmera and the Mallee. The Mt. Macedon bushfires of 1983 were the subject of a major series of paintings recording the destruction and regeneration of the bush over a number of years. More recently Jenni has been travelling to the Polar Regions working as an artist-in-residence aboard ice-breaker vessels. She has worked in the Antarctic and the High Arctic recording the polar land and seascape in paint, photography, video and the written word. Her work is predominantly oil on canvas, as well as oil and pastel on rag paper, pastel on paper and gouache. Linocut and etching techniques are used in her printmaking works. Alongside the landscape work is the series of ‘100 Australian Poets Portraits’. The portraits have been painted from life over a number of sitting and include: A. D. Hope, Les Murray, Judith Wright, Dorothy Porter, Chris Wallace-Crabbe, Geoffrey Dutton, Judith Rodriguez, Alex Skovron and Fay Zwicky, Peter Rose and Peter Porter. During 1996 she was artist-in-residence at Riversdale & Bundanon, (Arthur Boyd’s gift to the nation) on the Shoalhaven River NSW. Recent exhibitions include: ‘To the Ice: Images from the Antarctic’, Barn Gallery Montsalvat; ‘Fields Apart’, Adam Galleries Melbourne, ‘Poets Portraits’ at the La Trobe university. An exhibition of Australian Poets, ‘ Extraordinary People’ Parliament House, Victoria; ‘Antarctic Paintings’, New Parliament House, Canberra and Ice painting exhibitions at Hamilton Regional Gallery and Dickerson Gallery in Melbourne and ‘Desert, Ice and Poetry’ at Montsalvat. Most of my painting is completed on location. I search for the extra-ordinary in subject material. It maybe a landscape or a portrait of a person I find interesting, or would like to understand. Much of my work is painted in the arid inland regions of Australia such as the Northern Flinders Ranges, Lake Eyre in South Australia. I look for the excitement of intense light, mood and the dramatic sculptural land forms in the landscape. It may appear as a hard horizon line broken by distant vegetation ,a craggy rugged granite outcrop or in the detail of a stony gibber plain, a crisp salt pan or a foggy night. In contrast the melancholic beauty of a landscape reflected in a black waterhole, mist rising from the stillness of an early morning tidal river, or a pond with an unbroken surface. And then there is the Antarctic. 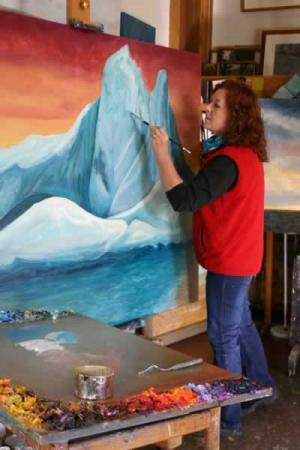 To travel to the Antarctic on a working cargo ship is a painting trip of a lifetime. The images I have brought back in photography and painting were barely enough to capture the merest glimpse of this awesome place. I have much more work to do before I feel I have come anywhere near to understanding the experience. Jenni has held numerous exhibitions throughout Australia, and has been included in many group exhibitions. Her works are represented in public and private collections in Australia, and overseas, including USA, UK. and Japan.